"We don’t just do science for science sake. We strive to do science that has an impact, this is technology that can do that across a whole range of different sectors." 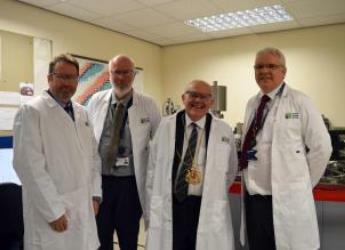 The James Hutton Institute celebrated reinforcing its extensive analytical chemistry capabilities for research and commercial work with a launch evening and ribbon cutting for their new Thermal Ionisation Mass Spectrometer. The £500K investment will allow the Institute and its commercial subsidiary, James Hutton Limited, to provide inorganic isotope measurements with unrivalled levels of precision and accuracy. The Lord Provost for Aberdeen, Barney Crockett, was in attendance to cut the ribbon and officially launch the new TIMS machine. He stressed the importance of investing in science: “I think cities in the future are going to need three things for success and that’s technology, talent and tolerance.. The purchase of the new TIMS instrument has been possible through the support of James Hutton Limited, the commercial subsidiary of the James Hutton Institute, and the Macaulay Development Trust (MDT). Honorary Researcher and MDT Trustee Bill Slee commented: “Over the last few years we have supported a whole variety of research activity at the Institute. It’s a really important source of funding and provides the opportunity to prime the pump of research, to get things moving and provide the kind of support that new ideas need. Head of James Hutton Limited, Dr Jonathan Snape, added: “I think what is important to note is we don’t just do science for science sake. We strive to do science that has an impact, this is technology that can do that across a whole range of different sectors. In the oil industry TIMS is commonly used to investigate the vertical and lateral connectivity of oil and gas reservoirs through the analysis of strontium in residual salts; this analysis can be carried out on cores that have been stored for decades or on wells where there is insufficient produced waters for analysis. It can also be used to date sedimentary rocks by analysing isotope signatures present in fossil remains of marine creatures. The provenance age of sedimentary strata can also be determined using samarium and neodymium isotopes which is particularly useful when bio-stratigraphy is not possible. The James Hutton Institute has instrumentation capable of carrying out isotopic analysis not just on soils and waters but on many different sample types, such as plant material, gases, phospholipid fatty acids and alkanes. For more information, visit our Isotopic Analysis page.